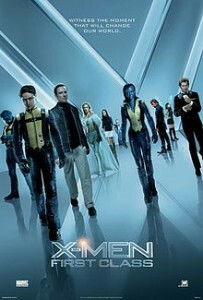 As a huge X-Men fan growing up, I had to make sure that I saw X-Men: First Class. I did enjoy the first two X-Men films (the third and Wolverine were complete poop), and was hoping that they could get that franchise back on track. If you can get past the inaccuracies it was a really good movie. I’m really glad to see another good comic book movie. The story, and characters were great. Taking place during the Cuban missile crisis was a great idea. They were able to work in the good and evil sides forming as well as the hatred that humans would have towards mutants regardless of which side they choose. Young Magneto and Xavier were really well done. It was great to see their different paths and ideology as well as how they would get to each. My favorite part was Azazel wearing a captains hat while hijacking the Soviet ship. I’m not sure if that was done for humor, but I don’t know why he would need to dress up as a captain aboard a ship of dead people. Excellent movie, go see it.